"Not just pictures but completed installations worldwide"
Top Stone is a privately held Florida Company, operating also in Arizona and China. In certain areas we also have established dealers/distributors for our "over 5000 items". Our factory partners multi-national company are located just outside of Beijing, and Xiamen China. We ship worldwide and have available inventory ready to ship in both United States and China warehouses. We only sell real marble, granite, bronze, etc. not concrete or fake marble. 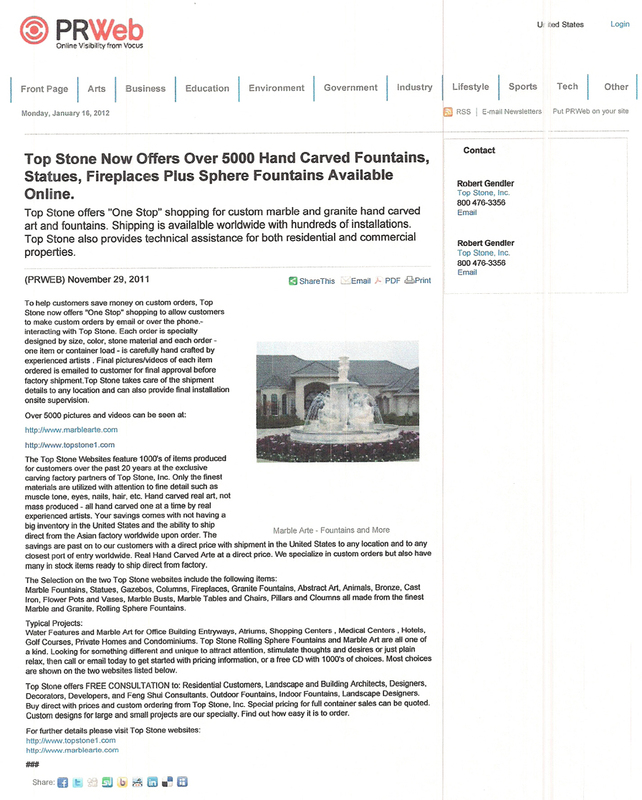 Top Stone has just been awarded the US copyright on over 5000 picture models and videos shown on our two websites www.topstone1.com and www.marblearte.com . Top Stone specializes in custom orders and can mix and match sizes, colors, and different parts of different items. Only the finest marble or granite is utilized with personal supervision from our Asian partner. Emailed pictures/videos of your order would be emailed for your final approval with every order. Top Stone can also assist with the technical aspects of your project at no additional fee unless on-site supervision is needed. We have the experience to help you get what you want along the way from concept to final installation. Call or email today to start. THERE IS NO REFUND ON CUSTOM ORDERS EVEN IF THE ORDER IS DELIVERED LATE.